The following is a post I made in a note on facebook in March 2009. The event recently came up in conversation so I thought it worthy to share again here, along with events that followed that were not documented in said note. It's creepy, and one of the most emotionally scarring events of my life. I came home yesterday after a pretty crappy day at work and a crappier commute home. But the weather was nice, and I have a patio that I absolutely LOVE, so I decided to try and enjoy the evening, and the kids and I had dinner outside. We have a daredevil cat who likes to perch precariously on the edge of our second-floor balcony and peek over, always looking like she might jump at any moment if the right thing catches her eye. So after sitting right next to our open patio door for a couple of minutes, Ethan decided to put the cat in and shut the door. PLEASE NOTE, WE WERE SITTING RIGHT NEXT TO THE OPEN DOOR, BUT IT WAS ONLY OPEN A COUPLE MINUTES. After we ate, we cleaned up and shut the patio door, and got our shoes on to head out for a walk. Ethan noticed a feather on the floor. I said, "the kitty probably found it on the patio and brought it in." She does that with leaves sometimes. As we were walking out the door, Ethan shouts, "There's a bird in the house!" There was a not-small BIRD perched on top of my patio blinds. And, as any responsible mother would do, I FREAKED OUT. Thankfully, it worked, but first the bird flew toward us, then made a u-turn and flew outside. Crisis averted. We went on our walk and came home to our safe, bird-free home, after my heart slowed to a normal pace. Today, we get home and Emma and I head to the back of the apartment. Then we hear Ethan shout, "There's a bird in the house and kitty's chasing it!" I step out of the bathroom just as the bird flies directly toward me, kitty chasing behind. I scream, jump back in the bathroom and shut the door. It flies to the back bedroom, and into my CLOSET! Emma and I run for the front door. Ethan's back there, trying to find it....not sure what to do. It flies out of the closet, and behind the dresser. Ethan pulls the dresser back and yells that it's hurt. Emma and I run back there, and I'm searching for a box or something to somehow get it into without touching it in any way. The bird suddenly recovers, and takes flight, causing me to have a mini heart attack for the 489789 time. Luckily, we had opened the patio door and screen when we first discovered the bird, and it found it's way out! Oh my God, there was a bird in here ALL NIGHT WHILE WE SLEPT. You might think birds are cute and harmless....You're wrong. Birds are cute hopping along the sidewalk. Birds are disease-ridden rodents when in your house. I fix dinner, and I'm sitting at the end of the couch, reading. I hear a scratching sound on the floor near me, and I assume it's the cat. Suddenly, A BIRD FLIES UP!!! A THIRD BIRD IN THE HOUSE! The bird flew directly into the closed screen at the patio door and stuck it's feet in. Again, good mom that I am, I send Ethan to open the door, and the bird unlatches itself and flies out. I've checked my entire apartment for birds. If there are more, I can't imagine where they could be hiding. The bigger mystery is how they got in. I was near the door the whole time it was open! And why would THREE birds fly into an apartment together??? This wasn't the end of the bird saga, however. The next night, I came home after my class around 9:30, in the dark. I pulled open the slightly ajar linen closet to get some things to get ready for bed... And as soon as I opened it, a bird flew at me! I remember it like it was yesterday. I screamed, ran into my bedroom, and shut the door, terrified. Birds might not seem scary to you, but birds in random places in your home, flying at you-- terrifying. The next day I called the apartment management and a series of inspections began. After several days of finding birds, including one horrifying discovery of bird poop all over my laundry room and a bird carcass on the floor, they finally discovered that there was an opening in my utility closet to the attic space that the birds were using to gain entrance into my apartment and torment me. The evil little creatures. Since this experience, I've detested birds. 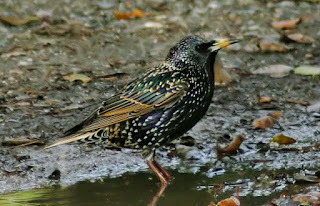 I have no interest in bird feeders in my yard, pet birds, etc. To this day, a bird nearby makes me jump up and arm myself or run away, much like when I encounter a bee. 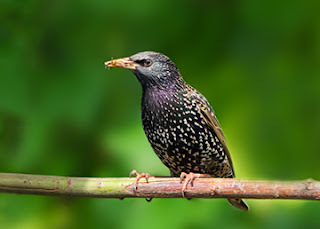 For reference, they were starlings, nature's ugliest, grossest birds.